This past month we took our first plane ride with Miss Lace! She did absolutely incredible. We took the advice of friends and nursed her during take off and this seemed to prove effective. However, while burping her after this nursing session she proceeded to puke her milk up all over mommy. I wasn’t nearly as prepared as I should have been as she hasn’t done this in a very long time. As a new mom, you quickly learn that the smell of fresh milk is quite okay compared to the smell of old milk so I took it with a grain of salt. After I air dried off the rest of the plane ride went seamlessly. She played with toys, enjoyed the multiple television screens, as well as the many interactions with the other people on the plane. The in flight safety demonstration provided her with great entertainment. Upon entering the airport, our girl learned to wave with the WestJet check in staff. This led to an entire trip spent waving at anyone and everyone who would make eye contact with her. Since returning home we now have the wave connected to the words “hi” and “goodbye” as well as anytime mommy picks her up as I think she assumes we are leaving. During our trip she also learnt how to clap when we ask her to as well as click her mouth on cue, which provided much entertainment on the long drives. Just like our last trip to Minneapolis, she did very well in the multiple sleeping arrangements and napping spots. She fell asleep quickly as always and without any protest. Her nap schedule went out the window starting day one and so she quickly learnt to nap when she got the chance, typically in her stroller. Some days she functioned on very little sleep but managed to remain happy as we toured around. While away and eating out she showed great interest in our foods and was quickly eating everything we were eating. She loves all types of meat, and enjoyed many breakfast foods such as toast, pancakes, french toast and scrambled eggs. She also has a great taste for French fries (who doesn’t?!) but still enjoys plain old cereal mixed with fruit for breakfast. 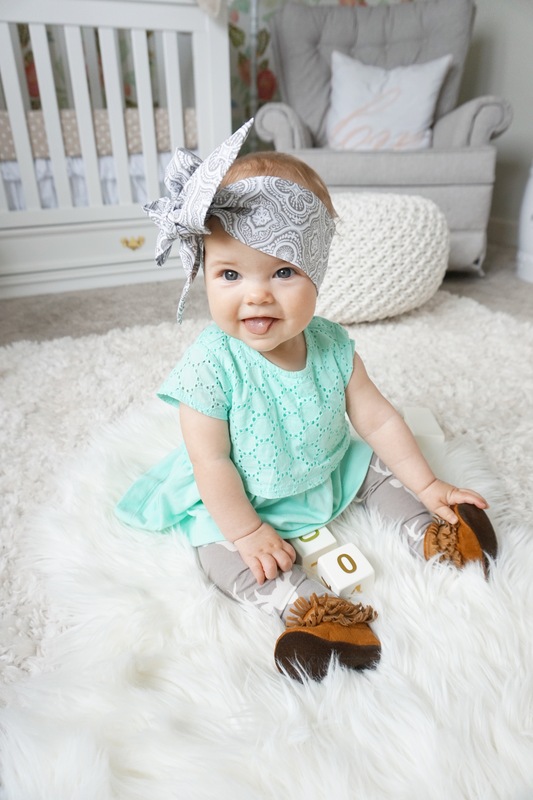 At her recent doctor’s appointment she was still following her momma’s height being in the fifth percentile for length but had moved up to the twentieth percentile for weight! 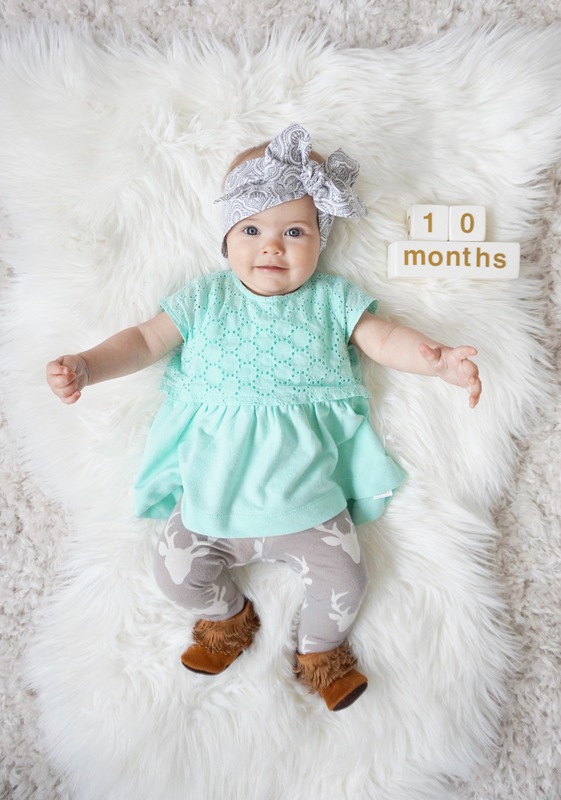 She hasn’t been more than the fifth percentile for weight yet and is currently weighing around 16 and a half pounds. It might be that all this adult food she has been eating has helped her pack on the pounds! Her schedule changed while we were in B.C. as she started to go to bed much later than usual due to the time change and late nights visiting and socializing. Since being home she has now been going to bed closer to 10:00 pm and waking up at 10:00 am. Although we need to work at getting her down earlier, this momma is very pleased with these new twelve-hour stretches. Prior to this she was waking for an early morning feed and going back down in the morning for an hour or two. We have yet to cut out another feed as Emsley doesn’t seem ready to remove any others. I suspected dinner might be next to go but she is still very eager for milk during that time. I am still breastfeeding four times a day but with the odd schedule change from our trip some days we have slept through one feed resulting in only three breastfeeding sessions. Her babbling and talking has increased this past month and she’s added a very important new word to her vocabulary. She ‘s been saying “mama”, “baba”, and “nana” for a bit now but has just recently added “dada”. We still haven’t experienced crawling and our bets are that she will skip this stage, as she prefers to be held by her hands and walk around. She’s also never been a fan of being on her tummy and will instantly roll onto her back when in that position. 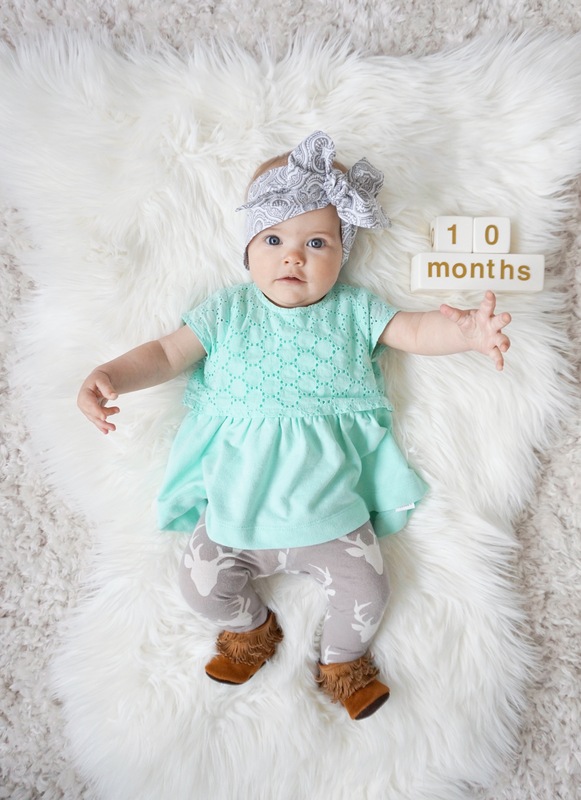 She has backwards crawled this past month and moved her legs forward but seems to get “stuck” when her hands don’t’ move with her legs. Instead of experimenting with it, she tends to whine and give up with a face plant onto the floor. She’s been pulling herself up to stand and cruising around the tables this past month so we are excited to see what happens next!